The Lucksmiths have had a remarkably busy year, recording recent album "Naturaliste" and playing sold out live dates in Australia, USA, Japan, England, Spain and Sweden. Now they spoil us again with a brand new mini-album "A Little Distraction" featuring six exclusive, eclectic songs. The music is warm and familiar - recalling the classic jangle of The Pastels and The Wedding Present as well as the infectious summery strum of Jonathan Richman. As usual, things are lyrically close to home. The opening track "Transpontine" dissects Melbourne's famed north-south rivalry, whilst (metaphorically perhaps) warning of the dangers of trekking too far afield. The dynamically bipolar "Successlessness" is a consolation to a disillusioned lover with sublime 12-string guitar adding just enough chime to reassure the listener of the song's sentiment. Elsewhere, The Lucksmiths strip things back on the heartfelt and yearning title track, and find themselves wandering through a darker, jazzier terrain as "Moving" takes a turn for the esoteric. Concluding with the ultra-poppy hit "After the After Party" and the lovely "Honey Honey Honey," it's all here and more. 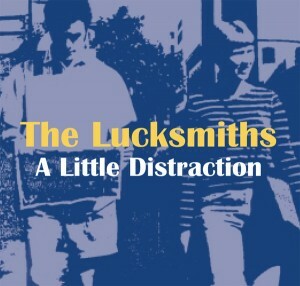 Reminiscent of their brilliant "Staring At The Sky" CD from 1999, "A Little Distraction" is the Lucksmiths at their very best. Deluxe digipak edition.